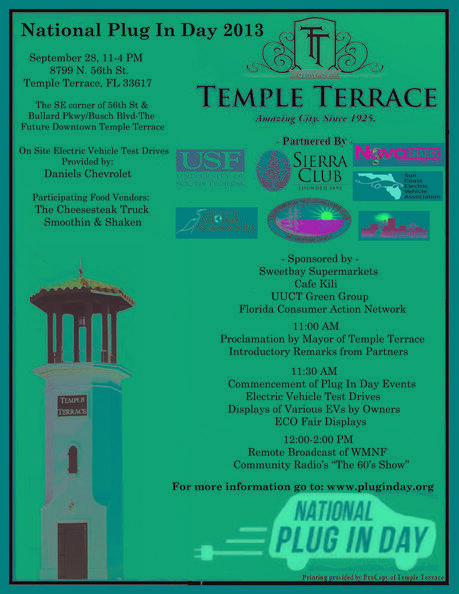 The Mayor of Temple Terrace, Frank Chillura, and members of the Temple Terrace City Council opened the Event by issuing a proclamation making Sept. 28th "Temple Terrace National Plug In Day". Representatives from several organizations promoting sustainable living in the Tampa Bay region also spoke including Steve Reiche representing the Tampa Bay Clean Cities Coalition and the University of South Florida Patel College for Global Sustainability with Britten Cleveland representing the Sierra Club. The Hillsborough County Environmental Protection Commission and the Hillsborough County Metropolitan Planning Commission set up displays informing attendees of the various ways they could live more sustainably including using public transportation more frequently and supporting the efforts for a major expansion of our transit system in the Tampa Bay region. Thanks to all for a wonderful EVent this year! A GREAT DAY FOR OUR EVENT!